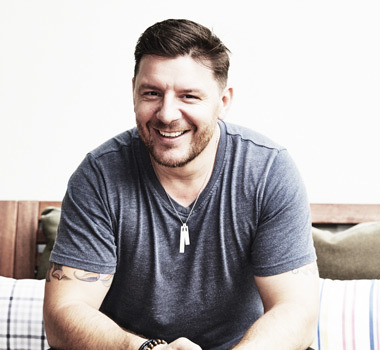 Despite enjoying a buoyant career that’s seen him become a household name, a humble pot of Bolognese prepared in Manu Feildel’s own home represents one of his most noteworthy defeats. The admission resolves a challenge set on the night he and his wife, Clarissa Weerasena, met. Coming from a food-loving Malaysian family, Clarissa’s influence on the man who, like Kylie, Hugh, and Delta is known across Australia by simply his first name, is clear. His most recent book, More Please (which includes Manu’s defeated Bolognese recipe), features a greater focus on Asian flavours than his previous titles, though the chef and author is quick to point out that his recipes shouldn’t be considered authentic. For authenticity, several of Clarissa’s family favourites are also featured in the book (on which she is credited as a co-author), though recording them for publication didn’t come naturally for the home cook. Combining influences is something Manu believes is fundamental to understanding the elusiveness of ‘Australian food’. While Manu concedes that combining influences can be rewarding – the couple now use butter in their fried rice instead of peanut oil – he believes it should be done with care. While More Please is rich with Asian-inspired dishes, Manu’s inspirations are drawn from across the world. Moroccan lamb, Japanese tofu and the aforementioned Bolognese all appear alongside the chef’s French recipes. View Manu's recipe for Asian-style mussels as featured in More Please.